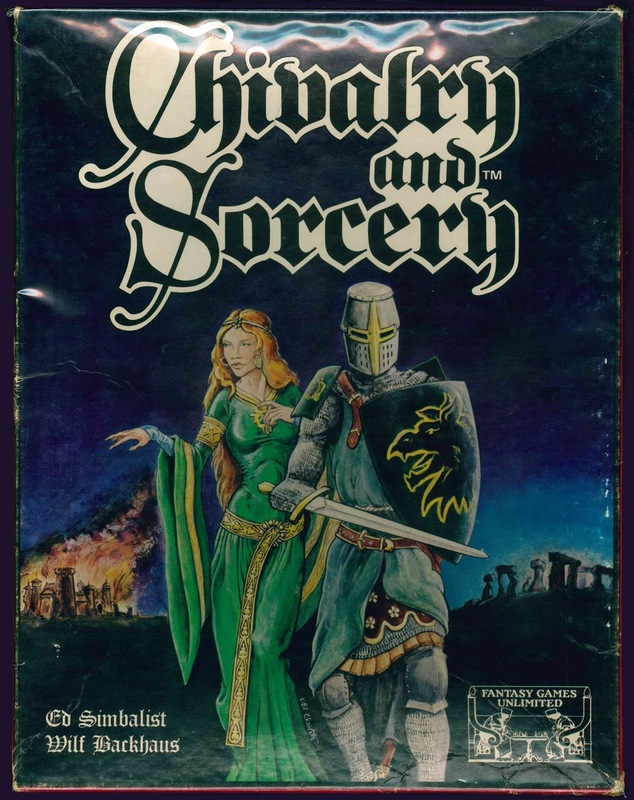 The second edition of Chivalry & Sorcery comes as a box set. It divides the rules into three staple bound books (and increases the font size slightly). The second edition retains much of the spirit and feel of C&S 1e and is presented in a somewhat more user friendly format. The focus remains on role-playing in a realistic interpretation of a medieval feudal society with an emphasis on knighthood and chivalry. The fantasy elements (elves, dwarves and haeflings/hobbits) rely heavily on Tolkien for inspiration. Magick draws primarily from several historic traditions, such as alchemy, astrology, necromancy and witchcraft. Mythological beasts, including centaurs, minotaurs and harpies, are included to add a fantastical element to play. Role-play is defined as taking place inside a fictional society with rules and consequences and what one does between adventures is almost as import as the adventuring itself. One may play a thief or brigand in C&S, but should expect to be pursued by the forces of law and order. The first book is devoted to character generation. It starts with game master advice regarding the implied setting parameters which are based on feudalism. It goes on to inform the player just what all makes role-playing in a setting based on feudalism different from that of our own society. Freedom and independence are quite lacking in feudal society and how one addresses their social superiors is very important. Character creation rules can be largely random and rolling on the tables can result in the character starting out as a serf or an escaped slave, or a prince of the realm. How such disparate personalities would end up adventuring together in a feudal setting poses some challenges. The C&S philosophy is don't expect equality (that is a modern American value). Of course the game master could just start all the characters with the same social birth rank. C&S is an old school game and the authors state clearly that game masters can alter the rules. C&S aspires to create a certain type of milieu, one quite different from what is found in many other FRPGs. C&S seeks to create a realistic feeling milieu where the character is living out their imaginary "life" in believable circumstances consistent with our knowledge of feudalism. The second volume starts off with a discussion of chivalry including its progression over the centuries and its practicality as a way of life. Role-playing a character under The Chivalric Code requires attention to one's personal honor, one's word, obligations and alliances. Vol. 2 continues with a detailed discussion of the Chivalry & Sorcery Marketplace and shows how that can be based on a realistic assessment of medieval economies. A discussion of the Cleric as a player character, the medieval church and clergy, tournaments and jousting follows. The section on Individual Combat takes us to the end of Vol. 2. The C&S combat rules are somewhat complex and allow for the use of tactics as well as arms and armor all based on examples from the European middle ages. The knightly class has distinct martial advantages in C&S, which makes it fun to play a knight. 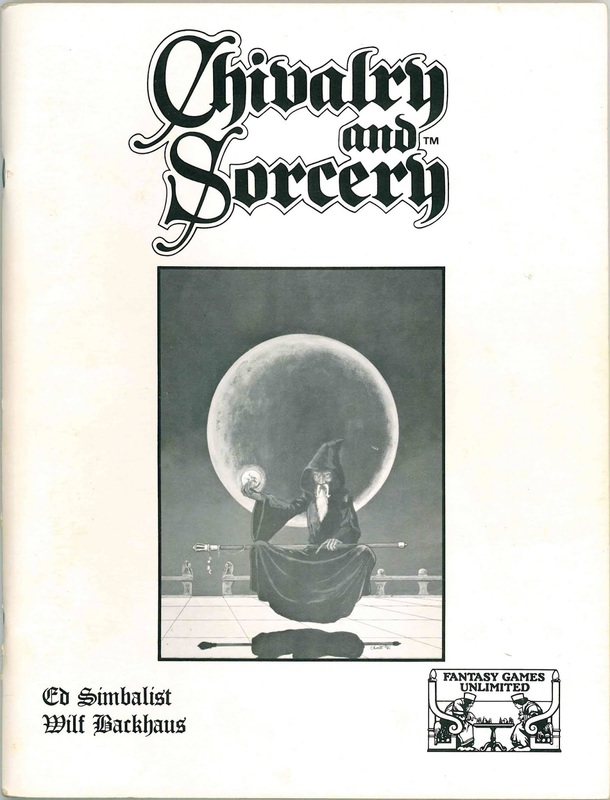 The third volume covers Magick & Magicians of all varieties. Like C&S 1e, 2e relies heavily on historical traditions of the supernatural powers (magic/magick) for inspiration. Magick practitioners may rely on their natural ability as Primitive Talent Magicians or seek schooling and practice magick as a form of sage knowledge. Elves and hedge wizards rely on primitive magick whereas scholarly magicians may study Drug Trance Magick, the Minor and Major Arcana, Alchemy, Astrology, Divination, Witchcraft, Conjuration, Enchantment, Necromancy, Thaumaturgy, Power Word Magick and Magick Square Mysticism (among others). 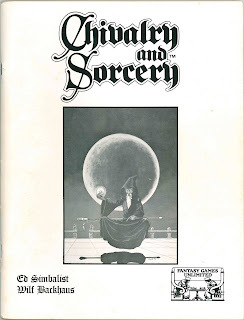 The many spell descriptions are often very brief and much is left open for the referee/Game Master and players to determine regarding how magick effects play in C&S. Vol. 3 concludes with 35 pages of bestiary including demon profiles, beasts, NPCs (dastardly knights, infamous brigands, evil priests, wicked witches and villainous magicians), monsters (mostly mythological) and the undead. 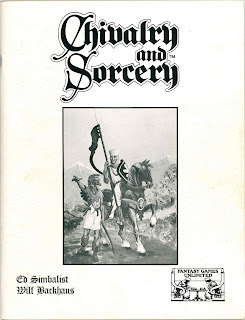 The C&S 2e line of products includes the revised Sourcebook and Sourcebook 2, which are both based on the 1e equivalents. Sourcebook includes several articles, many written by C&S co-author Edward Simbalist, which I find an entertaining read. 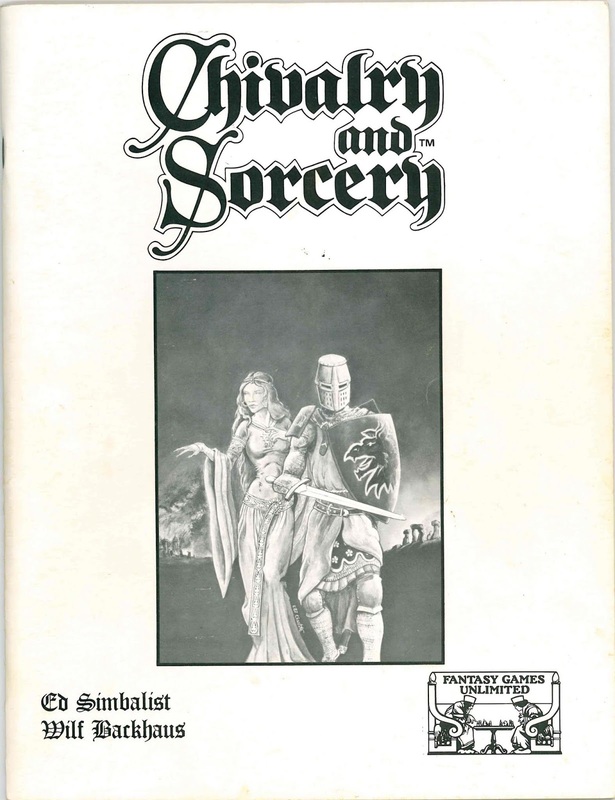 Articles included cover outdoors adventure, weather, monster design and the Forester class. As is usual in C&S this material relies heavily on the real world and a knowledge of history, which seems to be Mr. Simbalist's strong suit. Even in drawing upon fantastic influences, Mr. Simbalist refers frequently to various sources including the work of J.R.R. Tolkien, R.E. Howard, Michael Moorcock and Fritz Leiber. His discussion of the nature of monster mentality is quite thought provoking even today, suggesting monsters be designed and run in a logical, believable manner by the referee who should rely on knowledge of how intelligent beings and animals behave, what they eat and how most of them operate under a self preservation motive. 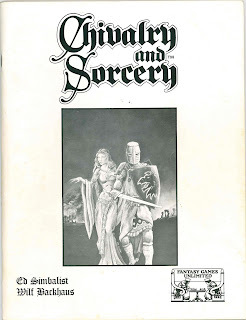 Mr. Simbalist's article on feudal economics again rests firmly on research and this type of research, rather than the active imagination which fueled much of Mr. Gygax and Mr. Arneson's content, appears to form the basis of his game writing. The C&S 2e Sourcebook concludes with a new battle system for tabletop ancient and medieval miniatures games. The author mentions that he is a miniature wargamer (much like Gary Gygax and Dave Arneson) and he provides for us his Battle System for those who also enjoy battle games using large numbers of painted miniature figures. While I greatly enjoy the content found in Sourcebook, some of that found in C&S Sourcebook 2 I find less inspiring. 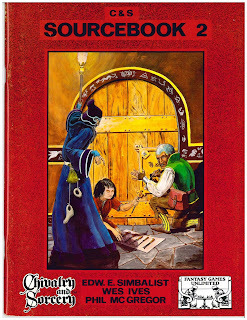 As the color illustration by Robert Charrette suggests, Sourcebook 2 contains an extensive discussion of doors, locks and breaking in. Mr. Simbalaist seems to be making a point here about realism and for my taste, there are more charts, values and mechanics describing how to adjudicate bashing down doors and picking locks than I care to use while at the table. 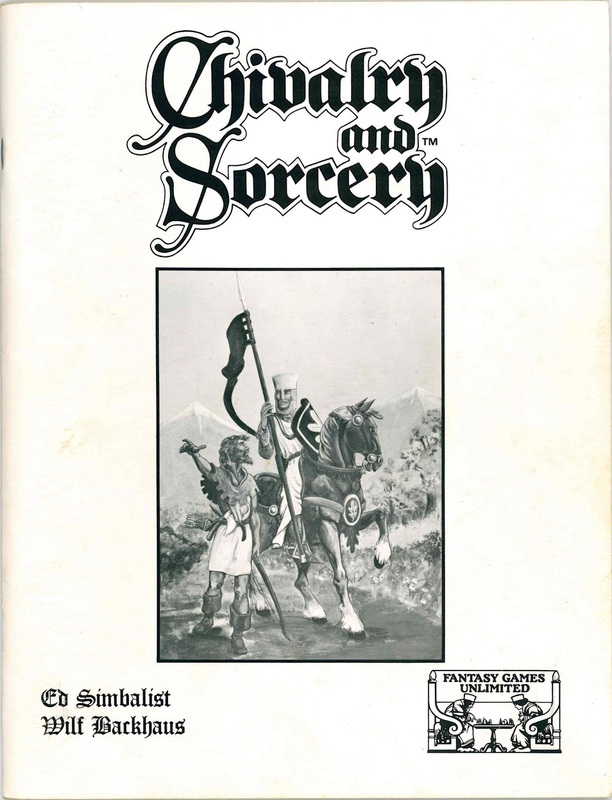 Reading the articles does inform the referee/ gamemaster, in perhaps a useful way, regarding the reality of such common elements of a fantasy medieval roleplay adventure game and this knowledge can be used generally sans the specific C&S mechanics, which are optional as the author states. 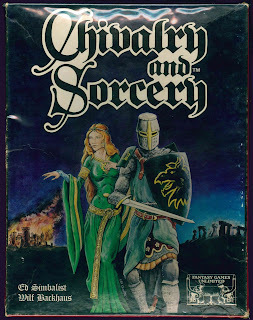 In fact, C&S is entirely presented in a very old school manner deferring to the gamemaster as having the ability to alter rules and procedures as well as create new content for their world. 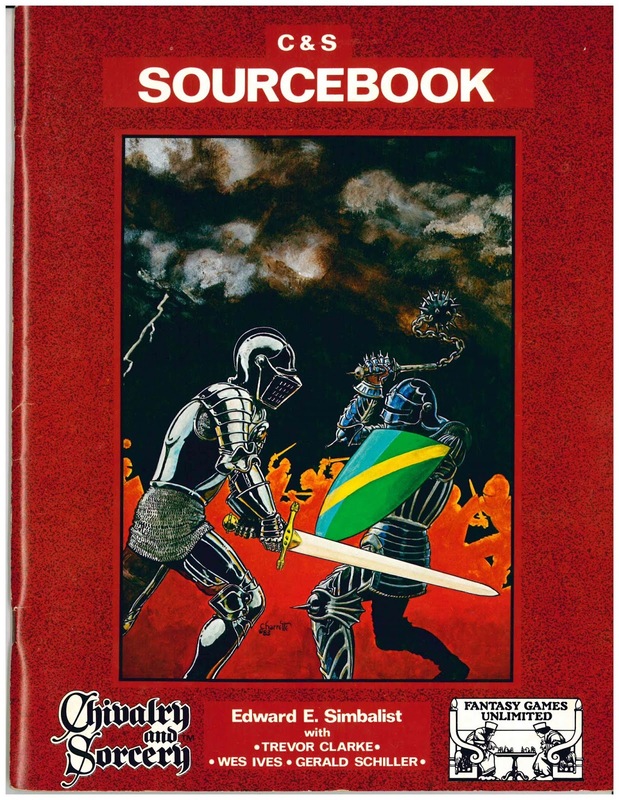 The random table is a staple of old school games and Sourcebook 2 contains many. An article on how to determine what spells a non-player magician knows includes a number of them. Weaponsmithing, alchemical materials and magical items are the subject of their own articles and here I find some interesting and usable content, although much of it pertains to down-time between adventure. 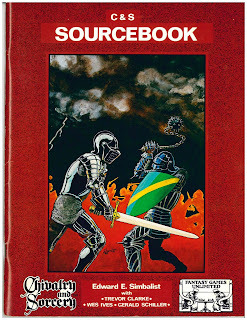 Sourcebook 2 also contains a couple useful articles on peasant revolts and how news and mail would be conveyed in a feudal society which can generate several ideas for adventure or can just form part of the background for PCs running a manor. Sourcebook 2 concludes with Phil McGregor's pen and paper strategic warfare system which allows for large-scale battle, siege and naval to be part of the campaign without the use of miniature figures. I like C&S 2e almost as much as C&S 1e. C&S 2e is more accessible with its larger font (still small-ish by today's standards), better binding (Red Book tends to shed pages) and generally lower second hand prices. C&S has a very different "feel" to it when compared to White Box and most other FRPGs old and new. Red Book C&S talks about what the authors term "the Grand Campaign", which perhaps is an idea unique to C&S. The way I understand the Grand Campaign is that it sets out to immerse the players in a make-believe world through their imaginary characters who lead realistic lives from birth to death including a detailed down-time between adventures. The alliances and chivalric honor the PC amasses is at least as important as the fights and adventures one encounters during exploration of the imaginary world based on a feudal model. The fact that C&S provides very little mechanical reward for acting in character seems consistent with the design philosophy that this immersion in play is its own reward. 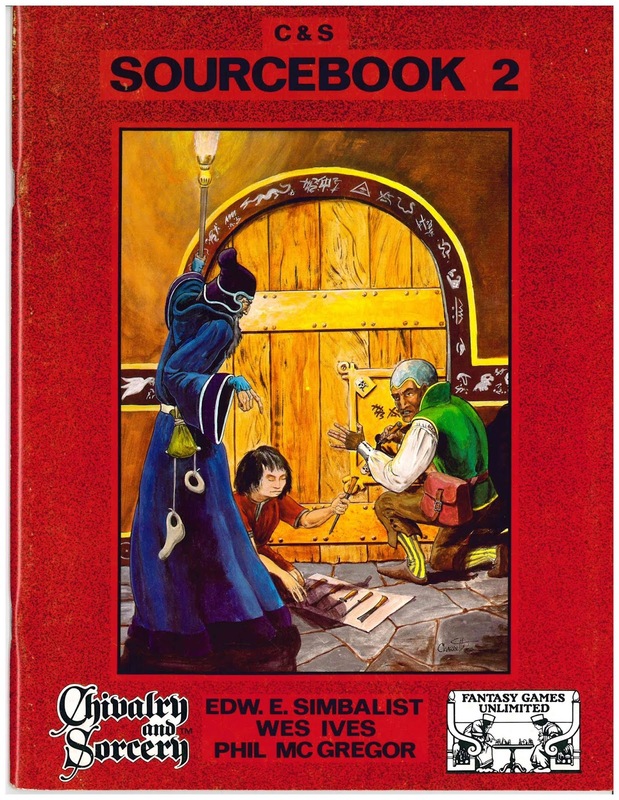 C&S is one of the "reaction RPGs" that were part of the zeitgeist of its 2nd generation era. It sets out to "fix" the problems the authors perceive to exist in other games (and states so quite clearly in several 1e passages). The details discussed and the general point of view expressed by the C&S authors are inspiring and I feel that in some ways I am more informed and equipped to referee and play all other games including White Box after a careful reading of C&S.